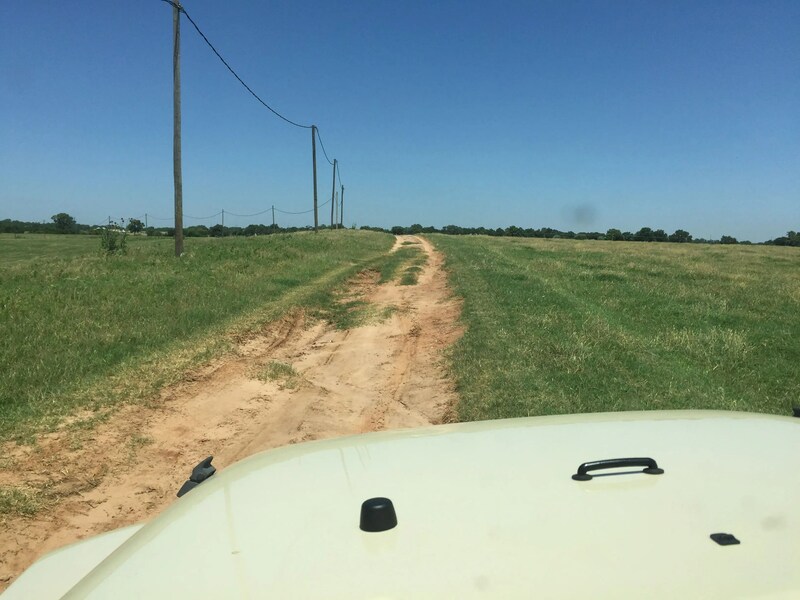 Kay and I were driving in our Jeep north of Enid, Oklahoma and saw a sign that pointed to “Skeleton Creek Ranch”. Thinking this was some type of cool dude ranch or something, we followed the signs to see something. Eventually one small sign pointed down a cow path in an empty field. Huh? We looked around and could see no “ranch” in site, so turned down the cow path. It looked like it was going towards and oil field tank, but then another little sign with just an arrow pointed down an even smaller cow path. Double humm. Now the going got a bit rough in our Jeep but never requiring 4WD – just bumpy and uneven. A couple of times we had to drive over into the grass to bypass a mud hole. This was now getting quite interesting. Finally we came to a small clearing overlooking more of a depression than a creek, but with the grain elevators of Enid clearly visible in the background. 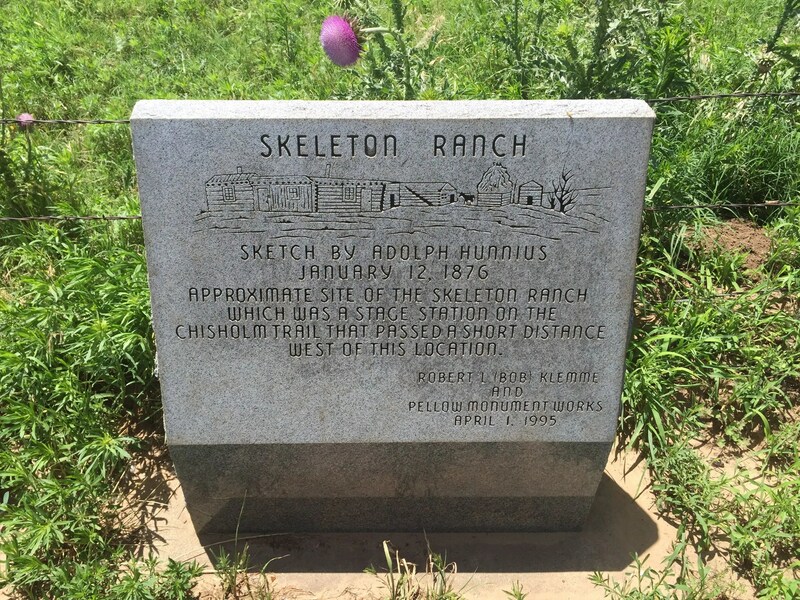 The only thing around was this marker explaining Skeleton Creek Ranch and how it came to be named. 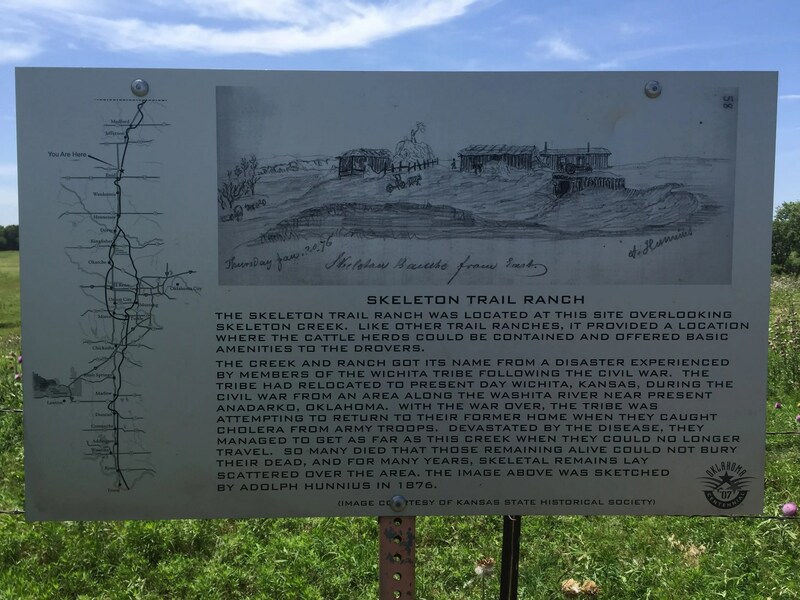 “The Skeleton Trail Ranch was located at this site overlooking Skeleton Creek. 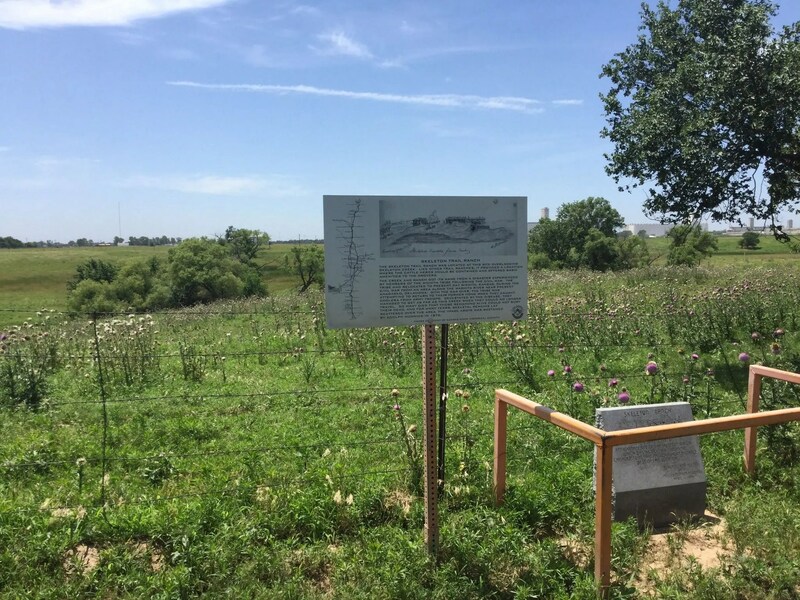 Like other trail ranches, it provided a location where the cattle herds could be contained and provided basic amenities to the drovers. This is a perfect side trip if you are in the Enid area, and an easy 10 minute jaunt from downtown Enid. Approach from the north and look for the small road signs. Click the Download link below the map to download a GPX file for your GPS. 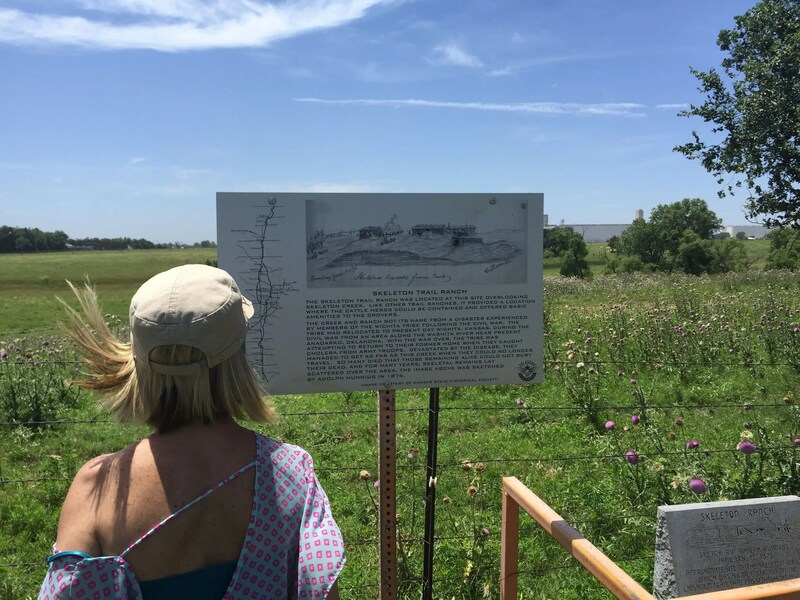 Kay reads the marker for Skeleton Creek Ranch. 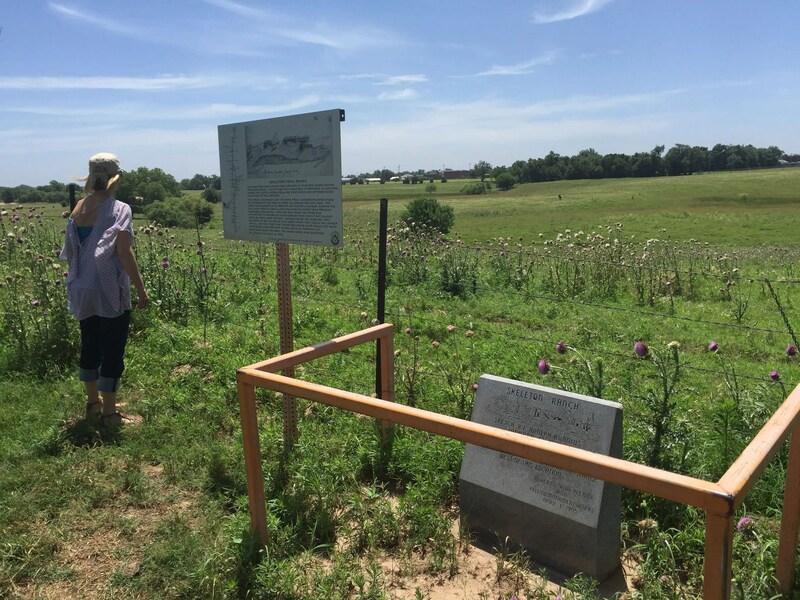 The marker is basically in the middle of a field north of Enid. Approach from the road to the north. This is the permanent marker at the site. A detailed marker with information about the site. Getting here requires a bit of off road riding. A pickup truck or any motorcycle can make it pretty easily. The grain elevators of Enid are visible in the background.